Dried apple is used as an ingredient in trail mixes, cereals or packaged separately for a variety of individual applications. Apples designated for Red River are picked at peak sweetness,washed, and cut into rings. We offer both sweetened and unsweetened varieties. 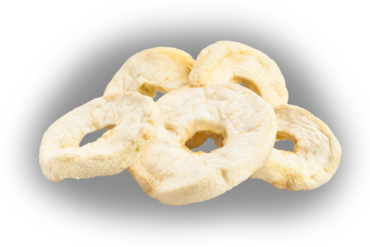 Many people enjoy dried apple rings as a light, airy, sweet snack. They are often rehydrated for use in desserts and baked products. Apples are high in insoluble and soluble fiber, providing 20 percent of one’s daily nutrients. The fruit also contains flavonoids, which are associated with reducing the risk of cancer, heart disease and Alzheimer’s disease.